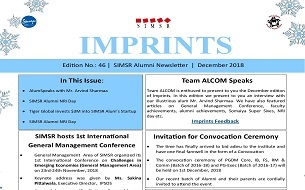 In our constant endeavour to stay in touch with our alumni, on the first of every month, we come out with Imprints - Alumni Newsletter. 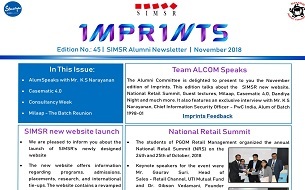 Imprints bring to the alumni the latest news about the events and happenings at SIMSR so that they are always connected to their alma-mater. It also covers achievements of alumni & faculty, AlumSpeaks – Interview of our illustrious alumni, Alumni events, etc.